September is Bourbon Heritage Month! On August 2, 2007, the US Senate declared September as “National Bourbon Heritage Month.” The bill reinforces the 1964 Act of Congress that declared bourbon “America’s Native Spirit” by celebrating the family heritage, tradition, and deep-rooted legacy that the bourbon industry contributes to the United States. This month-long observation celebrates the history and ingenuity of the Bourbon industry, which started in and is still 95% contained in the state of Kentucky. 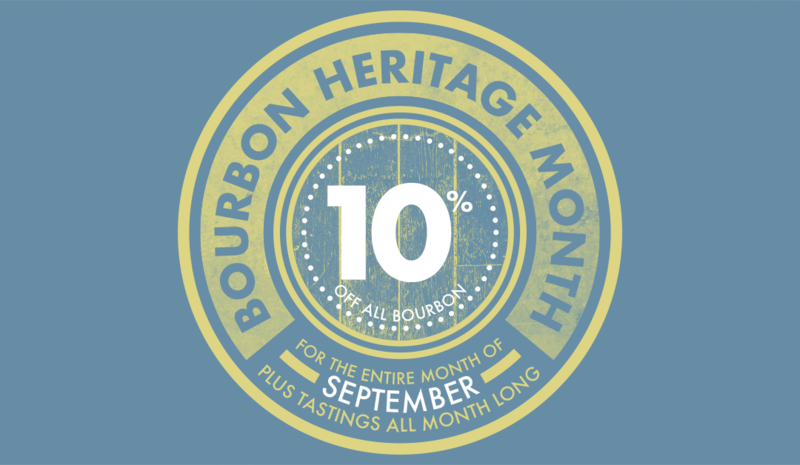 Celebrate the historic spirit with 10% off all Bourbons and American Whiskey for the entire month of September! We will also have several Bourbon tastings events featuring delicious bourbons and bourbon-based cocktails. There is a lot to celebrate, which is why we’re pretty much throwing a month-long party! *10% is taken off of retail value. *Must be a rewards member to qualify for the discount. – Not a Rewards Member? Stop in at any location to sign up for FREE!